On the banks of the long, winding Macleay River sits a regional town with an old-world twist. 50km from Port Macquarie and 421km from Sydney, Kempsey is the home of the Akubra hat factory, where the iconic Aussie hats are produced. The town has an outback charm that makes it a great destination for an overnight stop or even a longer stay. But don’t think it’ll be too isolated – the ocean is only 15kms away! Our Kempsey accommodation will provide you with a good night’s sleep without draining your budget. Enoch William Rudder discovered the town in 1836 and named it after Kempsey Valley in England due to the similarity of the surrounding areas. Now the town, and its surrounding shire, is home to more than 10,000 people. Don your Akubra and take a walk through town to check out historic buildings, antiques and collectable stores and op shops. To get a real feel for the town’s history, visit the Val Melville Centre in South Kempsey Park, where you’ll find the Visitor Information Centre, the Macleay River Historical Society Museum and an Aboriginal Art Gallery. Kempsey has its share of restaurants and cafes offering al fresco dining, including Netherby House which is right on the riverside. Get your shopping done at Kempsey Central Shopping Centre, which includes a Coles, a Target Country and several specialty stores. The Dunghutti people are the traditional owners of the land, and you can learn all about their way of life with a visit to the Wigay Aboriginal Culture Park. See how didgeridoos are made and what kinds of food and plants Indigenous tribes used for medicine. There are plenty of natural attractions in Kempsey’s surroundings. You can wander the Macleay River’s grassy banks, have a picnic or even hire a canoe. Just 21km from Kempsey awaits the town of Crescent Head, well-known for its surfing. Hat Head National Park is an ideal place for a bushwalk with its rainforests, sand dunes and beaches. There are plenty of walking tracks to choose from as well as fishing and whale watching spots. For more beach action take a day trip to South West Rocks Beach, another popular place for surfing, swimming and picnics. Sound like a relaxing time? Don’t wait any longer. 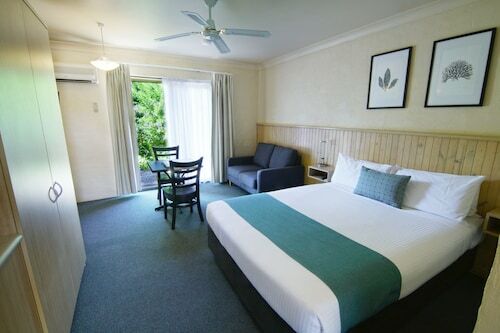 Book your Kempsey hotel with us and relax by the Macleay. How Much is a Hotel Room in Kempsey? 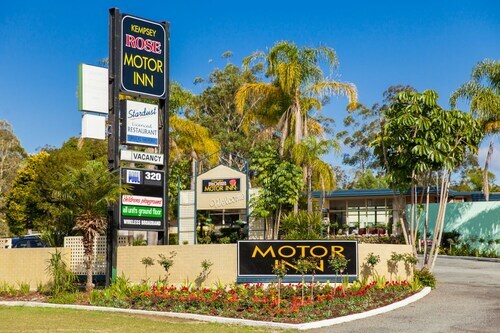 Hotels in Kempsey start at AU$85 per night. Prices and availability subject to change. Additional terms may apply. Excellent value for the price. I travel for work and when Im in Kempsey the kempsey Rose is where I will stay.